I’ve also started up a new flickr pool. Please join in and share some inspiration. Trying to slow down the pace at which I load up my shots. So happy to have another pool to see what everyone is up to in one spot! Molly– you are doing great over there– I’ll have to root around in our art supplies and my ever changing system for them and see if I have anything to share. So happy for your new gig– feeling like “we” get to share you with lots of other people– and that is a good thing. oh, what a delight to wander your way…beautiful stuff…eager to come again. From one Molly to another, Hello! I think I’ve been here before. 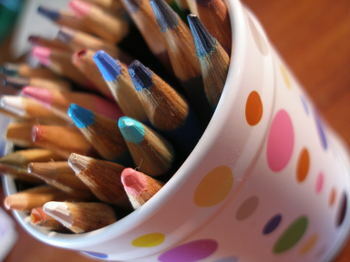 We have that same polka dot tin – seeing as it’s currently empty, I think I’ll fill it with colored pencils. I loved the Creative Summer Flickr pool (found some cool projects and some new friends), so we will definitely join the fun this Creative Fall. Molly, I loved your article and wanted you to know that I went out today with the kids and picked up the spiral drawing pads for each of the kids to keep. Thank you sooo much for that wonderful suggestion because you seriously don’t know how bad it’s gotten with the kids drawings ALL over the house. This way I can keep them forever and in one place. Thanks again!